Author, Garden Designer and Consultant, past Director of Horticulture of the Santa Barbara Botanic Garden. Along with the ubiquitous California poppy, a casual survey of California gardens will likely reveal at least one or more kind of Ceanothus. Since the late 1800s, this popular California genus has been coveted for its abundant and glorious display of fragrant blue flowers. This highly variable group of woody plants answers to many names � blue blossom, California lilac or wild lilac (for its similarity to the true lilacs in the genus Syringa), and ceanothus (which means thorny plant in Greek) � and serves as a stunning example of our state�s tremendous natural beauty and botanical diversity. Ceanothus can fulfill many functions in a garden: focal point, hedge or screen, groundcover, even espalier. Whether the arrangement is formal or informal, there is a ceanothus to complement almost every garden style. The problem is often deciding which one to choose. Literally hundreds of cultivars have been selected and introduced to date. As with fashion, popularity fluctuates over time, with some cultivars enduring for decades and others cast off like a pair of threadbare blue jeans. In addition, a handful of species, usually grown from seed, are occasionally available and sold without a cultivar name. By selecting several different kinds, gardeners can enjoy ceanothus blossoms from early winter through late spring. 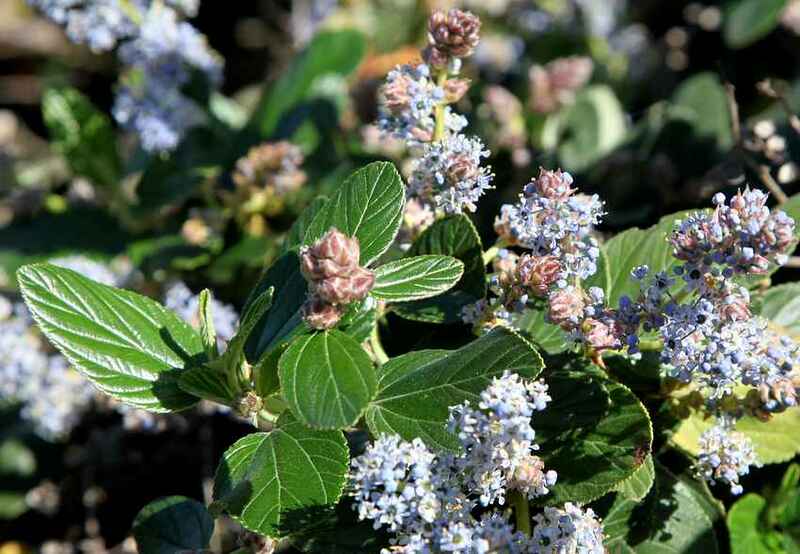 Although typically associated with chaparral in California, many ceanothus species occur in other plant communities, such as coastal scrub, woodlands, and forests. Some species are so widespread that they can be found in several communities throughout the state. The considerable diversity of the genus makes it almost impossible to generalize about placement and cultivation in the garden, but knowing its provenance will help fit the right plant to the right place. Overall, most ceanothus perform best in sunny sites, prefer well-drained, lean soils, and need minimal supplemental irrigation once established. Indeed, their lifespan is shortened if watered too liberally during the dry summer months, especially for plants grown in heavy clay soil. This scenario favors root-rotting bacteria and fungi that can kill an otherwise properly sited plant. Most ceanothus have nitrogen-fixing bacteria in their roots that help to nitrify the soil, thereby reducing the need for fertilization. Check this website for detailed profiles of the species and cultivars listed below that are available at San Marcos Growers. Ceanothus benefit from a light pruning after flowering to promote dense growth. Some species and cultivars grow exuberantly when young and may need pruning in order to develop a more pleasing form. If espalier or a tree-like specimen is the goal, early and ongoing pruning will be necessary. In general, limit pruning to wood that is no more than ¼ inch in diameter. Exceptions to this rule are species that have basal burls, which can be coppiced when they become sparse with age. If their utility and beauty are not enough enticement, then consider the habitat value of ceanothus. The button-like or puffy panicles of tiny blue to white flowers are an important source of food for bees, butterflies, and other beneficial insects. The leaves nourish larvae of several kinds of butterflies and moths. All of these insects in turn provide food for insectivorous birds. Birds also use the dense twiggy growth as shelter and for nest building. Ceanothus seeds, which can be heard exploding out of the drying capsules, are eaten by many kinds of mammals. Unfortunately, the native wood rat and mule deer find thin-leaved ceanothus particularly delectable and their �pruning� can easily mar a once-attractive specimen. Rabbits also browse on young plants, so protecting plants from these creatures may be unavoidable in some areas. A taxonomically challenging group, the exact number of ceanothus species is hard to pin down, partly due to natural hybridization. Roughly 50 kinds occur in the wild and are distributed throughout North and Central America, with the majority found (about 40) in California. They range in size from prostrate, mat-forming groundcovers to arborescent shrubs that attain 20 feet in height. Leaves are primarily evergreen, but a few species are deciduous. Flower color varies considerably, even within a species. The deep, violet blues are by far the most popular among gardeners, but sky, lavender, and smoky blues can be just as stunning. A few white-flowered selections create a snowy effect, especially when planted en masse. Foliage color is also variable: deep, almost black-green to yellow-green, gray-green or sage. There are even a few variegated cultivars, a rare occurrence among California native plants. Not surprisingly, leaf size varies, too, from ¼ inch to 3 inches long and texture ranges from smooth to pebbly to leathery. For the novice gardener, it is hard to fathom the tremendous diversity within the genus, particularly the two distinctly different subgenera, Cerastes and Ceanothus. These groups are differentiated by physical characteristics as well as reproduction method and response to fire. In general, species in the Cerastes group share small, thick, opposite leaves; persistent, corky stipules; flowers arranged in umbels; and fruits with horn-like projections. Lacking a basal burl, plants in this group do not resprout after fire but depend entirely upon seed germination to perpetuate the species. In contrast, species in the Ceanothus group typically have thin, alternate leaves; deciduous stipules; flowers arranged in racemes or panicles; and smooth fruits. Many of these species possess basal burls with dormant buds that resprout following a fire. Their seeds also germinate in response to high heat. Ceanothus has many ethnobotanical uses. Native Americans would mix the flowers with water to create a soapy detergent. Roots and leaves have reputed medicinal properties, and the long, flexible stems of some species are used in basket-making. The common name for Ceanothus americanus, a species from the eastern United States, is New Jersey Tea, which refers to its use during the Revolutionary War as a substitute for traditional British tea.